Great location and cul-de-sac lot in active swim/tennis subdivision of Breckenridge. Hardwoods on most of main level. Kitchen with granite and wood cabinets open to large family room. Formal living room and dining. 4 brms are all upstairs with generously sized master bathroom. Located mins from Newtown Park and the Dream Dog Park, close to shopping and dining. Northpoint mall and Big Creek Parkway is short trip away. Pets maybe allowed ask about restrictions. This wonderful 5 bed, 3 bath, 2,978 sq. ft. home in Hiram, GA! Open floor concept.Spacious living room with cozy fire place. Elegant formal dining room. Lovely kitchen with lots of cabinets and plenty of granite counter space with a breakfast area. Master retreat features dual vanities and a luxurious tub. Huge secondary rooms with beautiful bathrooms. Nice back yard. Be sure to schedule your showing and make this your next home today! Amazing 3 bed, 3 bath, 1753 sq. ft. home in Powder Springs, GA. Open and spacious floor plan. Huge kitchen with lots of cabinets and plenty of counter space. Breakfast area. Cozy living room. Large master suite features luxurious tub and separate shower. Beautiful deck overlooking wooded yard. Be sure to schedule your showing today! This newly renovated home set on the bank of a winding creek in Union Grove School district is sure to meet all the needs of your wish list! From the kitchen with its new granite counters that open to the breakfast nook and living room to the spacious owner's suite with its new carpet and large walk in closet, this cozy home will not disappoint! Welcome home to this spectacular 3 bed, 3 bath, 1,802 sq. ft. home in Canton, GA ! Spacious living room with cozy fire place. Lovely kitchen with lots of cabinets and plenty of granite counter space. Breakfast area just off the kitchen. Master retreat features a luxurious tub. Huge secondary rooms with beautiful baths throughout, Be sure to schedule your showing and make this your next home today! Welcome home to this spectacular 6 bed, 3 bath, 2,868 sq. 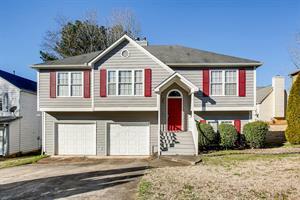 ft. home in Lawrenceville, GA! Lovely island kitchen with plenty counter space and lots of cabinet with custom back splash. Spacious living room features a cozy fireplace. Elegant formal dining room. Fantastic master suite features dual vanities and a walk in shower. Huge secondary rooms with beautiful throughout. Be sure to schedule your showing and make this your next home today! A must see! Location Location: Walk to Lake Lanier. Split foyer entry but lives like a ranch with a basement. Granite Countertops in kitchen and masterbath! Breakfast Room. Breakfast/Dining Room off kitchen. Master bedroom has his and her walk in closets. Additional bedrooms are very spacious. Living room has vaulted ceilings with French doors to the deck. Finished basement with hardwood floors, large bedroom, full bath. Walk out to patio and backyard. This wonderful 4 bed, 3 bath, 3,220 sq. ft. home in Kennesaw, GA! Lovely living room area with stone fire place. Huge kitchen with plenty of counter space. Over-sized master suite features dual sinks, luxurious tub, walk-in shower. Wonderful secondary rooms with beautiful bathrooms throughout. Spacious backyard with a balcony. Be sure to schedule your showing today! Stunning all brick Ranch with lots of space. Separate dining room, living room, family room and office. Beautiful kitchen with granite countertops and upgraded steel appliances. All hardwood floors on Main. Basement with 2 full bath, media room, tons of storage with 4 car garage. A large Master Suite and large Spa bathroom with his and her vanities and closets. Gorgeous views of Eagles Landing Golf Course with level backyard. Hurry!! Don't wait. Beautiful well maintained 3 bedroom 2 bath Brick-Front Ranch home, renovated with loads of features and major upgrades like hardwood flooring, custom light features, New HVAC unit, Roof, 6' borders around entire house, stainless steel appliances, granite counter tops, and double sink vanity in master with granite top. This sought out resort like community presence a stay and play environment which include tennis courts, soccer field, playground, swimming pool and clubhouse. Walk to schools and shopping for your convenience and pleasure.